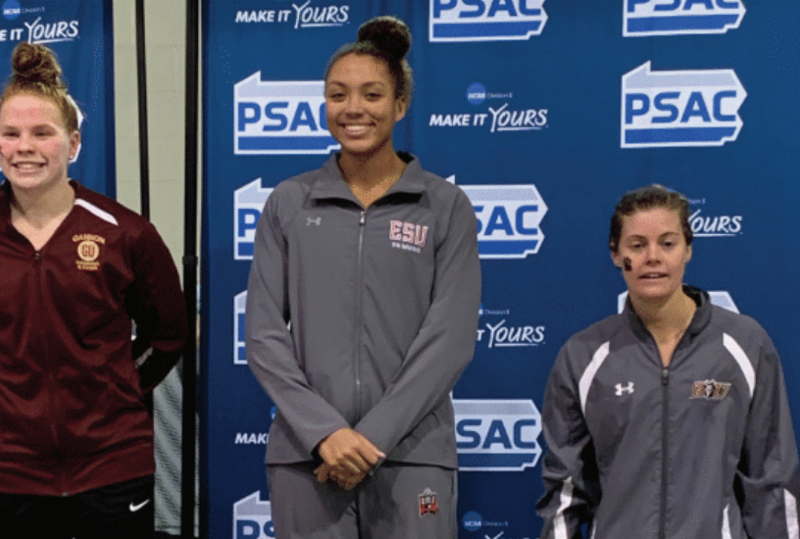 Junior swimmer Olivia Lukeshides standing on the podium at the PSAC Championships in York on Feb. 23. Lukeshides swam in both the 100 and 200-yard freestyle events, and finished exceptionally well. The junior demolished her previous personal record and set a new ESU school record in the 100 freestyle, posting a time of 52.16 in the preliminary rounds. This also helped her advance to the final as the number 3 qualifier. Sadly, she missed out on the Division II NCAA ‘B’ standard of 52.11 by 0.05. In the 200-freestyle final, Lukeshides touched the wall in fifth place. She didn’t stop there. She continued on to set another school record, breaking her previous record with a time of 1:55.70. For Lukeshides, this was a great feeling. Lukeshides also participated in the 400-yard freestyle relay and helped the team take home tenth place. For Lukeshides, this success comes after consistent hard work in the pool all season. Lukeshides finds her inspiration to put in the hard yards daily from her dad. “My dad was a basketball player so he has that competitive mindset and understands how hard training for a sport can be. He always wanted me to do my best and is always positive no matter the outcome. That really pushes me to do my best so that I can make him proud,” Lukeshides said. During the PSAC Championships, her team was also an inspiration and the support she needed to calm her nerves and put everything she had into the races. She described her team as a family describing the great team atmosphere. “We push each other every day in the water and going to practice and being able to swim with my friends makes it so much better,” Lukeshides said. She also said that despite the individual nature of each event in swimming, the team did a great job of coming together and supporting each other in their successes and failures.